As part of the great designer search, Wizards has all participants who passed the essay round take a 75-question multiple choice test to see who will advance to round 3. That test is posted online for everyone to see, along with answers and explanations. So, fellow cardsmiths, here is your chance to see how you measure in the eyes of WoTC. I took it myself and I must say it was harder than I expected, but I actually had a good time and learned a bit too. I got a 65/75 (%86.6666666...), which I was overall rather happy with. Tell me how you did, if you feel so inclined. @Arceus8523: what did you think of the BG vigilant flier question? Seems to have ruffled a lot of feathers among pro players. Yeah that one was kinda BS. I sort of understand the reasoning, but WU just works a lot better and even though flying, vigilance is both secondary in BG, it still feels like a color pie break to me. @Arceus8523: seemed more like it was testing reading comprehension than actual design knowledge. Was one of those 'gotcha' questions that you often see in school exams. Did you take the quiz and if so how did you do? Question 28 is kind of silly. 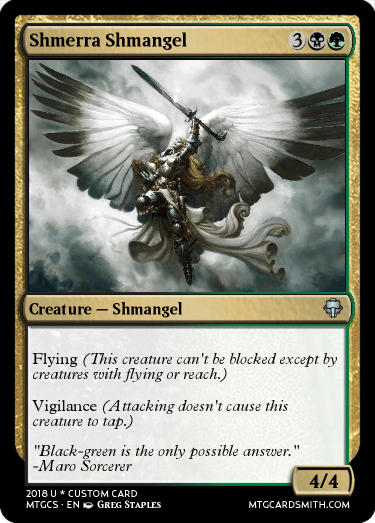 That said, Flying/Vigilance should be a Mono white or U/W card, not some sort of weird BG card. I don't think WOTC would ever print a BG vigilant flyer. I don't think the question was asking what WOTC would do, but rather if you understood what they could do according to the color pie. I get what wotc was getting at with the idea, but when the quiz is all about optimizing designs, I feel like that was a poor example of a question. I feel the exact same question could have been done better with different keywords and colors. @Arceus8523: I took it, and got a 62/75. You're right, it was harder than expected. Some questions I got wrong because I approached them too casually. "We are very unlikely to print a UW 4/4 vigilant flier. What is the biggest reason for us doing so?" Alright, my options might be sh*tty, but you get the point. This would've, IMO, been a better question as it actually tests your design capabilities rather than how well you take tests. That's a much better question! It takes the same concept and makes it much more about the reasoning of a design. I also like the wrong answer choices you provided. 59/75. A lot of the ones I got wrong, the correct answer was my second guess. Oh well. That was the same case for me. I got a 57/75. It was definitely tougher than I expected. Also, I made this, because the meme isn't dead yet.